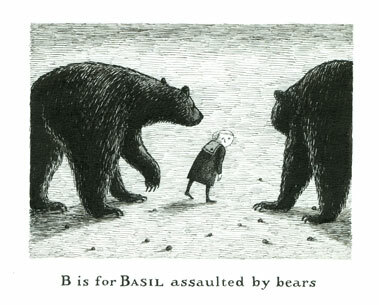 …and so starts the “Elegant Enigmas: the art of Edward Gorey” exhibit at The Boston Athenaeum, on through June 4th. 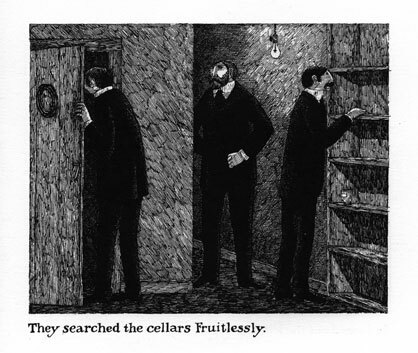 Gorey’s voluminous body of work encompasses art, literature and theater. His influence can be seen hovering over today’s graphic novels, and his appeal is timeless. He shows us how to be Goth and funny…and vulnerable, making us think, laugh and wince at ourselves and our society’s conceptions of what is proper. While you are at the Athenaeum, be sure to take your big blue visitor’s card and wander around as much as you can on the first floor (the other four floors are off-limits to non-members, although my friend and I did start chatting with one of the librarians, who whisked us away on a secret tour up to the second and fifth floors, which are wonderful indeed). There is a great view out the back windows of the building of the historic and oh-so-terribly-Bostonian King’s Chapel burial ground; but don’t even think about sitting down in any of the comfy chairs by the windows—those are for members only, as well. 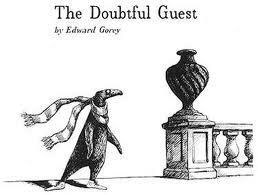 If you want to see more, there’s also the Edward Gorey house in Yarmouth Port on the Cape.